Once you get started teaching your child the basics of sewing, it is essential to feed its interest with a number of new fun projects. Naturally, you should choose sewing projects which can easily be completed by the child depending on its age and level of ability. Here are a few projects which I consider perfect for young and grown up children. These simple crafts will surely make a big impression on your child, and will definitely keep it pumped and wanting to learn and practice more! Super useful to keep your kid’s keys at hand + it makes super cool gift for mom and pop. All you will need for this cute little project are some fabric scraps, a piece of Pellon Peltex, an old key ring, buttons and felt, twill tape or a ribbon and pinking shears, thread and an iron. If your child loves reading, he/she will love to make this useful bookmark. To make it, you need to fold a piece of cardstock (4”x3.25”) in half and sew over the top and the right edge. Leave the bottom and left side open, so that you can slide the bookmark over the page. Ride on top of the fashion wave with these super cool emojis. For these keyrings, you will need some pieces of felt in different colors, a keyring and fastener, scissors, a needle and some cotton threads and wool in colors matching the emoji’s of your choice. Something small yet super useful that will keep your sunglasses scratch-free. You can use this idea to make a case for your phone, tablet or an e-reader as well. You will need some outer and inner fabric, fusible interfacing and a smaller piece of fabric for the loop. It is convenient to have this simple phone wallet on hand so you can just tuck your phone in and get about your errand. Your child will be happy to make this simple yet pretty canvas phone case. The materials you need are: some sturdy fabric, sew on Velcro, some felt, a clasp, thin cardboard and sewing tools. These bags are easy to make, cute as well as useful. Make sure that you have: ½ yard of fabric for the top and another ½ for the bottom, ribbon or twill tape, felt scraps and a large safety pin. Amazing project for the little princess and something she will actually love to wear. Use fabric, felt and interfacing scraps, a simple elastic headband and any buttons, pearls or accessories of your choice to make this lovely headband. You will need scissors, a needle, some thread and a glue gun. Every child will love making one of these keychains. For this project, you need: felt scraps in different colors, some ribbon, yarn and a keyring, as well as a needle and some glue. These make wonderful home decorations as well as gifts. All you will need are 5 inch fabric squares, lavender buds and sewing tools. You will end up with fresh smelling and moth repelling little sachets. This is another very easy project which your little seamstress will love. You will need a small fabric strip with a width of about 3 inches, D rings and some fusible fleece for added sturdiness. Let your child enjoy turning an unused pillowcase into a cute skirt which she can actually wear. You will need some elastic, an optional trim, thread, pins and a machine. Teach your child how to make these adorable friendship bracelets, so that it can give them out as presents to its friends to wear. All you need is a long fabric strip, fusible interfacing, thread and embroidery floss. Let your kid use a piece of heavier fabric plus some chiffon or other sheer fabric with a couple of elastic hair ties to make a headband to suit its own personal preferences. Let it add some beads to make a flower on the top. Your child will love wearing the pin while enjoying its next sewing project. The project involves the use of some old bottle tops, elastic, a piece of fabric and trims and some stuffing for the pincushion. Let your kid make its own pretty headband with the help of a strip of fabric (5”x45”) and at the same time practice its hand or machine straight stitching skills. Any child will love working on this particular project. The materials and tools needed are: ¼ yard of woven cotton, small scraps, toy stuffing, embroidery floss and some thread and pinking shears. Your child will find it easy and fun to make its own potholder with the help of two fabric square pieces, several batting squares. It can practice its sewing and top stitching skills with this nice and easy project. What a better way to teach your child the art of garment making that having it make an actual doll dress! You will need: fabric, ribbon, a safety pin and a sewing machine. Let your youngster choose the colors and patterns for their doll dress. These bookmarks make excellent gifts. You child can easily make one of these with some decorative ribbon, an elastic hairband, buttons and a sewing kit or a machine. 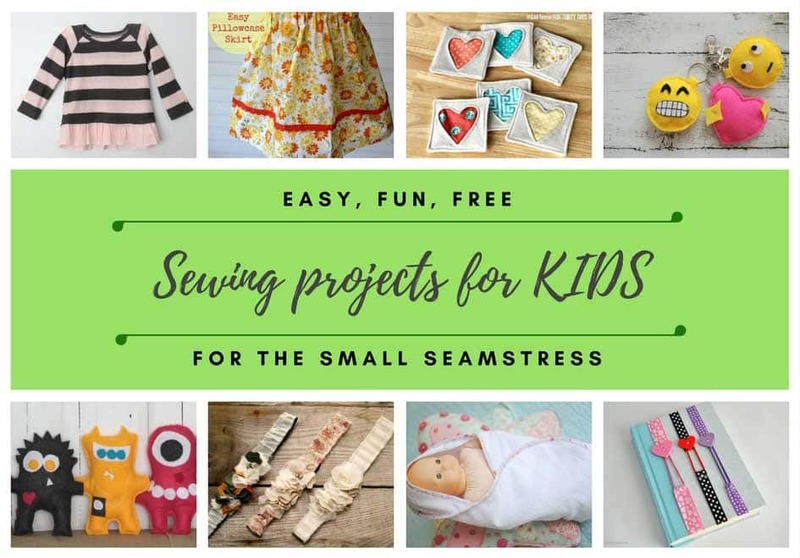 This project is excellent sewing exercise for a child, plus it will learn how to craft something useful with its own two hands and some fabric and a needle and thread or a machine. Your child can make these coasters quickly and will enjoy picking its own colors and patterns for the design. All you need is some fabric, batting, a little fabric for the heart and a needle and thread. You can use a pen or coordinating thread for tracing on the heart shape. Quick and easy, this is a great project for newbies in sewing and for children. You need 12 fat quarters of cotton for quilting in order to make 6 wonderful cloth napkins which you can actually use after that. Your kid can make its own pencil holder for school with some craft felt, lining, some colorful fabric pieces, a button and a ribbon. Let your child enjoy making some girly teddy bear clothes by itself. All you need to provide for this project is some fabrics, a piece of elastic, a sewing machine suitable for kids …and lots of enthusiasm. Get your kid involved in all steps of this project by allowing it to trace the monster pattern and pick out the accessories, nose and eyes by itself, so that it can make its own custom-made monster to play with. Let your daughter or son make their own towel for an American Girl doll or other doll. You will need only some terry cloth and bias tape for the making of this cute little towel. Let your child make a unique accessory for an existing T-shirt by making and sewing a scallop detail along the neckline. You need: fabric scraps, a circle of trace, a slue gun and a T-shirt. This project will help your kid produce a cute ruffle hemmed sweater with about ¼ yard of coordinating fabric and a sweater and they will be happier than ever to be able to make their own clothing as such an early age. My little girl wanted to make some clothes for her dolls but I thought it would be too fiddly. The doll blanket is something I didn’t think of! What a great idea. I’m so glad you like the doll towel/blanket idea! You know what, not all doll clothes are fiddly. Have you checked #20 – the Doll Dress With Fancy Ribbons – it is just few simple straight stitches and sliding a safety pin with the ribbon though. One of the ladies said in the comments that her 5 year-old daughter did it!